After three years of meaning to put up a gallery of the miniatures I had painted that weren't Nurgle I finally had the time and opportunity to do so. So what is this Nurgle miniature doing in the gallery? Well, I also wanted to show the progress I had made by contrasting this figure with the first couple I painted. This isn't really a fair comparison because this is a 'character' model and the others are 'rank and file' but this model clearly shows a better grasp of highlights, shadows, blending, washing, inking, drybrushing, and mixing colors. 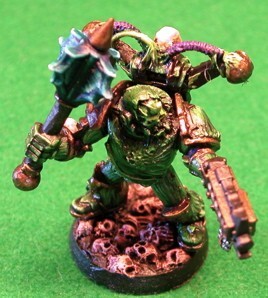 This model is but one of many I've painted for my Nurgle Chaos Space Marine Army, the Diseased Sons. This model is also stylistically different, the old GW painting style was to use brighter colors to help the models show up better on the game board. A white primer was used known still as Smelly Primer it was brushed on. Games Workshop is a much larger corporation now and they advocate using a spray on black primer and generally darker more realistic paint schemes. That said I don't necessarily paint my models the GW or 'Eavy Metal way.